The optical and nervous system of the fruit fly Drosophila melanogaster. (Inside Science) -- While fruit flies may bother people who have week-old bananas at home, the humble insects have for decades benefited scientists studying how organisms live and grow. The tiny flies are more like humans than you might initially think -- about 60 percent of fly genes match with a similar human gene -- and they breed quickly in the lab. Beginning in 1933, the Nobel committee has so far awarded six prizes in physiology or medicine for fly research, including the 2017 Prize for uncovering how the body's internal clock works. Now a team of scientists in Austria has given fruit fly researchers a handy new tool to prepare their specimens for study: a recipe for making a see-through fly. Dubbed FlyClear, it includes step-by-step instructions for how to soak fruit fly larvae, pupae or adults in a series of chemicals that turn the flies transparent. The fruit flies' eyes -- typically a bright red -- were especially tricky to clear. 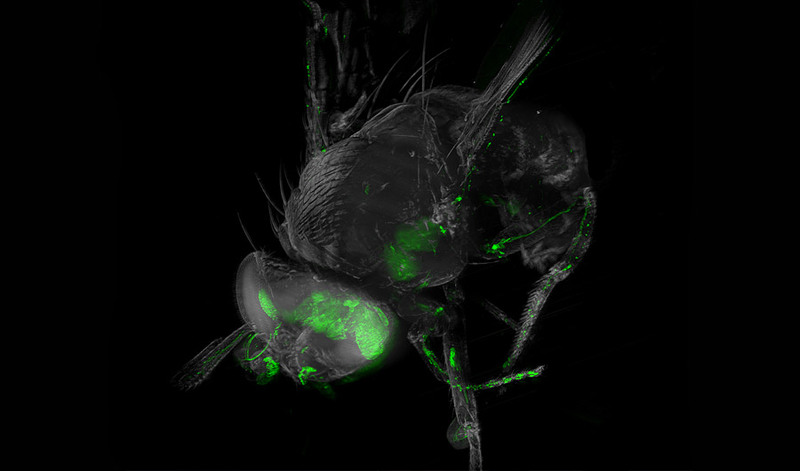 A see-through fly is useful because the insects can be genetically modified so that parts of their insides glow, and this glowing can be imaged with a microscope (without having to chop the fly up into bits) if the light can just travel through the fly. One key advantage of FlyClear is that it works without destroying the molecules that make the fly glow. The team demonstrated the approach by creating high-resolution 3D images of the nervous systems of fruit flies at various stages of development. The images could help scientists study the way neurons connect and how those connections govern behavior or change in cases of neurodegenerative disease. The work was published this month in the journal Nature Communications.